Will automatically convert your files every time. Will ask you every time you upload a file if you want to convert it. Upload your files normally after indicating your preference. The setting takes effect immediately. To compose and revise in your word processor only, have the files convert automatically. Just remember that changes you make on your Google Drive will not show up in your word processor. To make a back up of your word processor file, don’t use these settings. Convert your files manually. 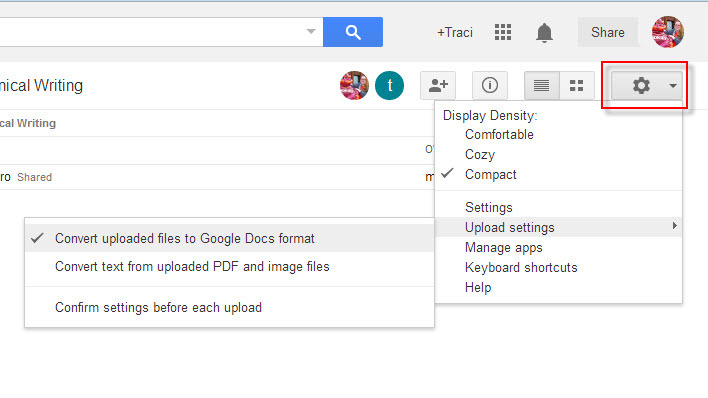 To use Google Drive for other classes, choose the option to confirm settings before each upload, which will let you decide every time. That choice gives you more flexibility.